Wow! is all I can say. I'm so excited to show you one of the four new kits that are being released. They are by Cri-Kits and absolutely the best quality gel pen I've ever used. AMAZING! A few things that I find to be the best about these pens is that the carrier is magnetic and holds the pen in place. It just snaps in there. SO COOL! The quality of the pens ROCK! Not one of the pens I played with skipped ink, and I played with all of them. The flow is fantastic. Each kit contains 10 pens, thats over 40 colors. When you order you can choose kits with just the pens or with the pens and carrier. 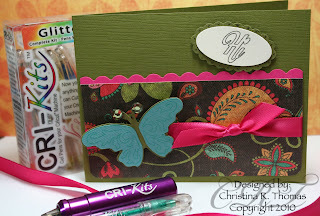 Cri-Kits are also offering a free carrier to people with competing products or previous Cricut Gelly owners. Here is a video I did for them showing the Gelly Pens. I didn't mention in the video, but I should point out that I used a textured cardstock and not one skip of the pens. Make sure you head over to the Cri-kits website and check these pens out, also check out their forums as well. For their Grand Opening Cri-kits is having some great giveaways. A Gypsy, Gift Certificates to Cri-Kits, and much more. And if you have read this whole thing. I'm giving away all 4 kits. Just comment below and I will pick 4 winners on Friday, March 26th...The kits are due to be shipping on April 6th and I will receive my kits for giveaway then. What a great looking product and you have explained it in such detail, answering many of my questions over pens and the cricut. Those look very nice, the letters are very sharp. Thanks Christina, a great video, i am going to head over to there website now. I can't wait to watch the video when I get home from work. Right now I use the gelly pencil grips and mini gel pens from Staples--works ok but is a pain to get in the right spot. Would love to have the holder. Thanks for the info...heading to their site now. Great video. You do such an amazing job of explaining how to do something or how something works. Can't wait to watch your next video. How very cool! I've not been wowed by the Cricut pens, but these I would absolutely love to own. Thanks for the chance to win. Great card and a great video so well explained. Thanks! WOW! What a neat product! I would love to win one to try it out! What a neat product!! Heading over to their website to check everything out. Thanks for the chance to win!! I think your blog is awesome - I always look forward to your videos! Those pens look awesome. Looks great. Thanks for the chance to win some. Thanks for the info too, I am going to the website now. These are so cool! Would love to win! these are amazing and your video showed how easy they are to work with. can't wait to get a set of those pens, they look great. Those pens look awesome! Thanks for a chance to win! I love your videos!! These pens look terrific. I can't wait to try them out! Off to check out the site now. Love them! Thanks for all the great tips! Love those pens and the magnetic holder! Thank you for the chance to win! Wow! These look amazing! I just recently got my first set of the PC markers for my Cricut, but am loving the resluts I've seen these pens, and would love the bigger selection of colors! Thanks for sharing the info and the chance to win! Love that they are magnetic! Thanks for the chance to win them! colors look amazing! Thanks for all your posts and inspiring ideas! Wow, Christina those are amazing. I have really never been interested in pens for my Cricut before! Now I totally am. Thank you so much for sharing your beautiful card. I've tried the PC markers, but these look like they produce a much finer line which I would like. Thanks for the intro! Wow, a gel pen that doesn't skip!! Who knew?? Those look great - thanks for the video! Really cute card!! Would love to try them! A gel pen that doesn't skip? Wow! I can't wait to try it! Beautiful card too! These pens look great for doing smaller details than the current cricut pens. Can't wait to try them. Hope I win. Love the effect of the glitter pens!! Thank you for the chance to win!! Wow!! These seem amazing!! I would love, love to win some!! thanks for sharing the great video!! YOur blog is awesome..Love It!!! Very cool product! Thanks for the great video showcasing it. I just love your card. Thanks for the info & your experiences with the Cri-Kits. They sound wonderful. I would love to win some. Thanks for the chance. Very cool looking product! Thanks for all the info! What a cool product! Endless possibilities! These look great! Thanks for the chance. I have never seen the markers in use, thanks, I will need to get some. Great card by the way! I am amazed at the ease of use!! The magnetic holder is a HUGE plus for one that has hands that don't always work well!! Thank you so much for sharing!!!! These pens look fantastic. Can't wait to give them a try. Beautiful card also. Amazing product. Would love to win. Good luck everyone. Thanks Christina for the chance to have these. I have been using the "Cricuts Gelly Pen" set which is about the same thing (has nothing to do with PC Cricut) - these look very interesting in that there are multiple choices of pens! Thanks for sharing this great product and offering the chance to win!! BTW, great card! They appear very versatile. Write with your cricut and by hand. thanks for a chance to win a set. This is only my second time to REALLY visit your blog and look around. I like all of your designs! They are quite unique and inspirational. Thanks for the opportunity to win and I can't wait to see what you come out with next! Love the gel pens. They are a must have. Thanks for a chance to win. Looks like a great new product...heading over to check it out now!!! TFS and thanks for the chance to win. Wow. These look like a great addition! I'll be sure to jump over to their website...but I would LOVE to win a kit!!! I have often wondered what to do with pens or markers in the cricut. I love the accent on the butterfly! Thank you for sharing some ideas. I am headed over to their site to check this out. These look fantastic. I would love to win some. Love these pens! Your video and card was wonderful, as always...thanks for the chance to win...looking forward to seeing the videos of your mini albums! 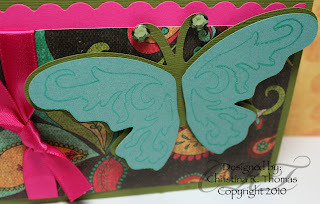 You are one of my favorite designers, I just love the cards you make!!! Great product! Would love to win it! I came over to your website to see what the name of the patterned paper is - it is really striking! I don't see any credits,and it wasn't mentioned in the video. Do you happen to remember the line? Thanks so much - you're projects are always gorgeous! Keep those videos coming! Thanks for the chance! I have the markers, but have never tried the pens! Wow! Great video and great product support for those Cri-Kit pens... I hope they reward you handsomely! Loved the video and the demo of the Cri-Kits pens. Thanks! Thanks for the info on the pens. Going to check them out now. Neat, neat idea! Skipping is why I have avoided jelly pens. Hi Christina, you are are right these pens look like the "rock"! Can you say endless possibilities :), if I win, there are so many things that I already have in my head. Thank you for the opportunity, you and your videos are the best! They just look great...thansk for the information..
Oh my goodness, I did not even know these existed, OOOOH I would love to these. Thanks for showing this. I have been looking for this product. Will be ordering this weekend. I love it! Another way to use my Cricut! Thank you, Christina! Wow, great quality! Super cool product! I have only had my Create for a few weeks, but I have watched almost all your videos. Thanks for all the inspiration and tips. I love the card you made. The glitter gel pens will add another level of sophistication to our homemade cards. Great idea! Great card. Love the pens. This sounds very interesting. I can't wait to try them. How fun is that?!!! Thanks so much for introducing us to this great new product! You definitely showed a great way to use those pretty pens! Beautiful card and I love the gel pens. Thanks for taking the time to explain how they work. You made it so easy to understand. Thanks also for the opportunity to win the pens. Wow, these look great....can't wait to try them out. Now I need to decide on a project. P.S. Thanks for sharing the great tip about putting the scrap paper underneath! Sure will save me a bunch of frustration! Thatks for the info on the pens. And for a chance to win. I am amazed on the ease of the pens. Can't wait to try. Here's hoping I win!! HOLY COW!! These are sooo cool!! Thank you for sharing. Can't wait to check it out! Ever since i saw this idea, I've wanted it. Just waiting for the money to order them!! Thanks for the great opportunity to win!!! Love the butterfly! What a great idea - love your endorsement. Headed over to their website right now to look around. These look great! Thanks for the video. Hi Christina. Finally able to add a post. Love this card. It is so colorful. Those pens look awesome. Great video, thanks for the demo. Cute card too! Love the gel pens! Really cute butterfly! Thanks for all your help. Love the gel pens! Would love to win a set! Thanks for the video! Very cool. I have used some gel pens in my Cricut and love them. Would love to have these new kind and see how they work. that is a lot of wonderful colors too! Those are very nice and sure do show up nicely on the card. I have been wondering which pens are the best to get. Thanks for the info. Thanks soooo much for the cri-kit pen information. I think it is great they are making them to use with and without the cricket. This will make LIFE GOOD! Oh I love the new Cri-kits! How fun is that!!! Neat pens! I'd love to try some! did a super job explaining it. Would love to win those pens. Hi Christina, I would love to win the cri-kits gel pens. I love your site and enjoyed seeing your craft room makeover with all the wonderful ideas. Looking so forward to watching more videos---I missed your videos. Appreciate the information. Looks like a must have. Could you tell us more about the single line fonts? Will they be available for free or are another purchase? Hi Christina, great video, I would love to win one of the Cri-kits set, thanks for the chance . Great video, thank you! Oh my, so many things we can do with our bugs. I really need to get a PT job so I can afford to use my bug to its full potential!!! Wow those are great and I love the butterfly cardf. I love these pens. I want these pens. I must have these pens. I can't wait to get my mitts on these things!! Thanks for the video.....what would we do without your help? Super Awesome Product! Thanks for the wonderful video on showing us how amazing this product is. Great video as usually. I love the new Cri-Kuts. Must go to their website now. Thanks for sharing this great new info with us! OMG !! I would love to win those pens! PS... i used the tip from your craftroom make over to store my punches!! My mother was with me when we saw how you stored your punches and today she bought one! and WOWO love it!! Thanks for the idea!! what a pretty card! these little pens look wonderful to use!! they are something i would definately like to try!! Thank you for the opportunity to win! Thanks for the demonstration and for telling me about the new pens. I am so excited!!! I really like the way those pens work, Christina, and the butterfly is beautiful! Thank you, Christina for another great video.Thank you for providing a demonstration of the Cri- Kit pens. I'm heading over to the website to find out more about them. WOW! Looks great! Gotta check these out! Thanks for the video and introducing another great product. The pens look great!!! I NEED them all! Thank you for the opportunity to win. Great video. I love those. I would love to win a set! Wow! This sounds fantastic! Hope I win! Oh gosh! I LOVE these! I went to their site and the price is good. But I would LOVE to win a set! Wow, this looks really cool! Thanks for sharing this with us! Wow...what a great idea! Loved your video and how you explained the pens. So many new ideas come to mind right away. Love these markers. I can think of so many projects! It boggles the mind! I'm ready to try these!! Thanks! Thanks Christina, I was going to buy the ones from CC but I'll check these out first! These look great. I haven't tried the markers or pens yet, but I would love to give it a try. What a great new product! I want these! Oooh these look like alot of fun! Great video, showing how to use these pens. Cool video. Thanks for all you do. I've never tried gelly pens with my Cricut. I may have to give it a go! I would love to try out the new markers. They are so cute. Gloria C.
WOW - those Gel pens are cute! Would love to win. Thanks for the opportunity!! Very pretty card! Would love to try the gel pens on a card....beautiful! Wow- the pens look really fun! I'd love a chance to play with them. Thanks for posting the very cute card. Wahoo! Something to use with my Cricut to make it more versatile. These should have finer detail than the Cricut Markers. How exciting something new--for Cricut but not by PC. I would love to win a set. These look great. Thanks for the give a way. Wow! These pens look really cool. I so want to try them. Looks like a lot of people are reading to the end!! Thanks for all the great info!! They look totally awesome...can't wait to try them out! Wow. Would be a great tool to use on cards or page layouts. Thanks for sharing your testing of them with us. These look like wonderful pens. Your explanation is so clear. Would love to win a set of these. Nice card, Christina. Those pens look really cool I'd love to win. The pens look great and after seeing you demo them, I definitely would like some. Very interesting. I haven't played with any pens in my cricut yet - maybe these are the ones. WOW!! Thanks for a chance to win! This would be GREAT to have! I hope I'm lucky!!! Thanks for the video! Pens look very interesting. Thanks for the opportunity to win a kit. Oh...how exciting! I would love to win one of the kits. Great addition to the cricut! Great card Christina. These pens look awesome and how cool is it that they come with the "holder"! I'd love to win a set. Thanks. This is JUST what we've been waiting for. Thanks so much, Christina, for sharing this opportunity! This would be a great b-day gift to me. Just celebrated my b-day yesterday and boy would this be nice to receive. Thanks for this great giveaway Christina! Gels pens are always great to use. These look really cool! I especially like the fact that they are magnetic! So kind of you to give sets away! Thank you for testing out these pens for us before we buy. They seem to work great. Thank you for the chance to win! Thanks for the video and keeping us informed of new products!!! Thanks for the demo. I just LOVE your videos. Very nice of you to do some give-a-ways. I love the pens and the card!!! These pens are just wonderful. A real must have. Thanks for the chance to win. Looks like my cricut needs some pens. Thank you so much for taking your precious time to show us this great product. I'm looking forward to watching your mini album series. Hope you release it soon. I love the idea of being able to use the pens in my machine. Thanks for the great video and information. I am heading over to the other site right now!! !